Regal Menu, Vintage Menu, Victorian Menu, Formal Menu, Black and Gold Menu, for your Wedding or Special Event - finished size 4.25" x 9"
Regal Menu, Vintage Menu, Formal Menu for a wedding or party. 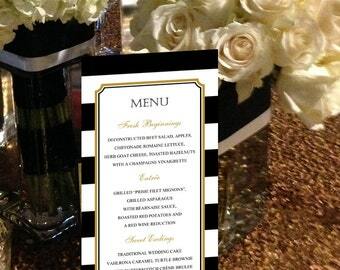 Add a sophisticated touch to your special day with these Regal Menu, Vintage Menu, Victorian Menu, Formal Menu, Black and Gold Menu, for your Wedding, Party or Special Event - finished size 4.25" x 9". Great for the DIY bride or party planner looking for stylish wedding or party decor! 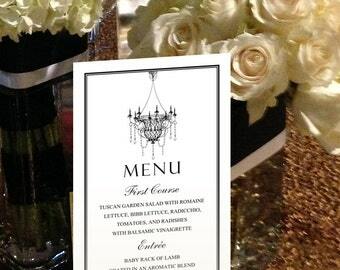 These menus could add the finishing touch to your table. Either lay them on the plates, put one in a frame or stand them up on the tables in decorative holders. This design is shown in Charcoal and Brass colors. 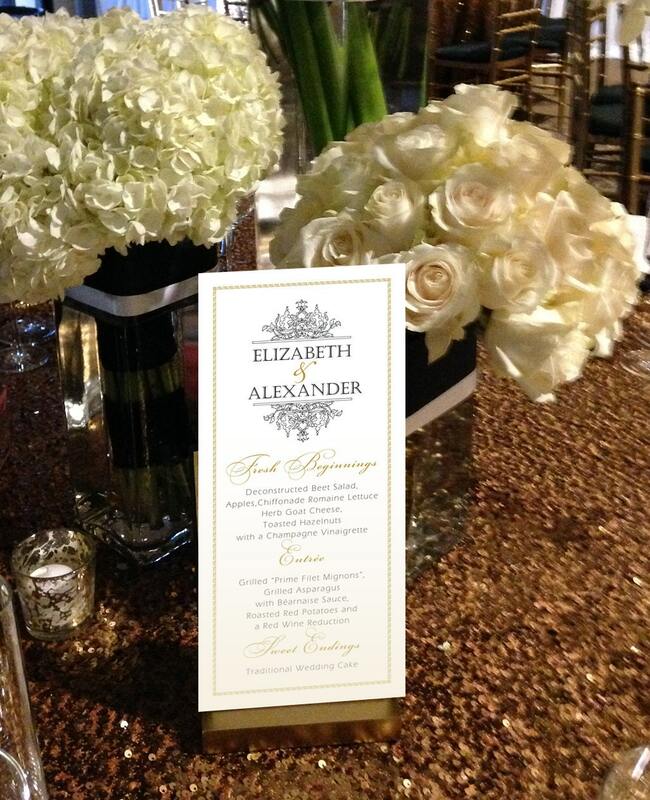 The fonts are Wedding Script, Open Face and Sans Serif Block. ♥ LOVE THIS DESIGN BUT WANT A DIFFERENT COLOR? With this design you can change the border and text colors. You can pick any color from our color chart shown above. Note that the drawing of the motifs at the top is an actual artist rendering and the color can not be changed. ♥ Like this design and want a coordinating Seating Chart, Table Number, Place Card, etc? Check out our store. New items being added every day and if you don't see what you need, send us a message and we'll see if we can design one for you. ▶ We recommend printing on white or cream card stock for the best color presentation. You will get 2 menus per 8 1/2" x 11" sheet of card stock. See printing tips and paper recommendations below. 1. Add this listing to your cart and check out. 2. Send us your names, font choices, desired colors and the food you will be having at your event in the message to seller area. Please include the date of your event. 4. You check over the proof and let us know about any changes you would like to make. 5. You will get 2 proofs included in the price. We are happy to make as many changes as you want but after 2 proofs, there will be an additional proof charge of $10. 6. When you are happy with your design, we will email you a high resolution file to print from. 7. You can either print these yourself or take them to your local printer or office supply store. No physical item will be shipped as this is a digital purchase. ♥ Cut to size and place on the plates, in a frame or special holder and enjoy! Art Deco Menu, Black and Gold Menu, Hollywood Menu, Regency Menu, 1920s Menu for your Wedding or Special Event - finished size 4.25" x 9"
Cross Menu, Formal Menu, Vintage Menu, Church Menu, Greek Cross Menu for your Wedding, Party or Special Event - finished size 4.25" x 9"
Floral Basket, Vintage, Victorian, Menu for your Wedding or Special Event - finished size 4.25" x 9"
Floral Menu, Arch Menu, Vintage Menu, Garden Menu for your Wedding, Party or Special Event - finished size 4.25" x 9"
Pinecone Menu, Forest Menu, Woodland Menu, Pinetree Menu for your Wedding or Special Event - finished size 4.25" x 9"
Flourish Menu, Romantic Menu, Decorative Menu, Wedding Menu, Formal Menu for your Wedding, or Special Event - finished size 4.25" x 9"
Blue and White Menu, Monogrammed Menu for your Wedding or Special Event - finished size 4.25" x 9"
Vineyard Menu, Grapes Menu, Wine Country Menu for your Wedding or Special Event - finished size 4.25" x 9"
Whimsical Cake Menu, Black and Pink Menu, Formal Menu, for your Wedding, Party or Special Event - finished size 4.25" x 9"
Formal Menu, Black Menu, Chandelier Menu for your Wedding, Party or Special Event - finished size 4.25" x 9"
Natural Tree Garden Setting Menu for your Wedding or Special Event - finished size 4.25" x 9"
Lantern Menu for your Wedding, Party or Special Event - finished size 4.25" x 9"
Sunflower, Garden Party, Bohemian, Menu for your Wedding or Special Event - finished size 4.25" x 9"
Rustic Western Menu for your Wedding or Special Event - finished size 4.25" x 9"